This was a chance meeting of a street masquerade in Serekunda, The Gambia. 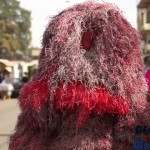 From our previous experiences in some parts of Africa, masquerades and people around them are always camera shy and don’t always like to filmed. This masquerade was a welcome exception.